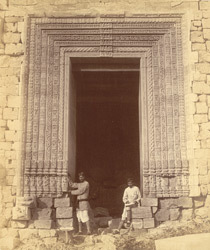 Photograph of a close view of the doorway in the eastern façade of the mandapa of the Surya Temple or Black Pagoda, Konarka from the Archaeological Survey of India Collections, taken by William Henry Cornish in c. 1890. The Surya Temple at Konarak was constructed by king Narasimha of the Eastern Ganga dynasty in 1240 circa. This colossal temple complex was too heavy for the friable soil on which it was built and the 70 metres shikhara covering the sanctum collapsed in 1837 as well as the roof of the dance pavilion. Only the jagamohana survived with its large pyramidal roof profusely decorated with sculptures of musicians, dancers and maidens. The temple is conceived as a colossal processional chariot of the Sun with 12 pairs of carved wheels, drawn by 7 rearing horses. This is a head-on view showing the doorway, with decorative carved architraves in seven bands. Two Indian figures, presumably survey assistants, stand in the doorway to indicate scale.